Texas The Drought Of 2011 - How Dry Is Dry And How Hot Is Hot? Living at the edge of the Texas Hill Country, in Comal County, and not too far away from my hometown San Antonio, changing weather from one day to the next is a common occurrence. Living next to the winding Guadalupe River has been a learning and a gratifying experience. The river has its own particular sounds and temperament. On most days the river flows quietly, humming in rhythm with the chirping of the birds. This very same river flows swiftly and noisily at the end of a hard rain. The one sound I am not comfortable listening to is the roaring, crackling racket it makes when it’s flooding. But today the sounds of the Guadalupe River are silent. 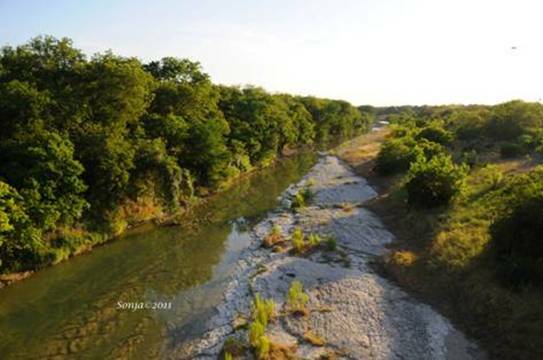 I have been tracking and photographing the ever changing Guadalupe River for the last 17 years. The signs were there…signs that told me that the river water was vanishing. This is the third time in the last 17 years that I have experienced seeing no water in the river. The last time was in 2009. 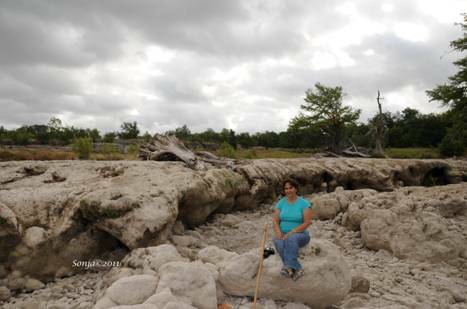 My husband Bill and I walked down the middle of the river bed that July and enjoyed photographing but we failed to pay attention to the time spent in the deep well of the riverbed. It took me weeks to hydrate my body from heat exhaustion. Texas is experiencing the third worse drought in history behind the number one 1956 and number two 1918 droughts. Making this dry spell worse are the wildfires roaming Texas. Governor Rick Perry has renewed the December 21, 2010 Emergency Disaster Proclamation twice, once in March, and again June 11, proclaiming 249 counties as extreme fire hazards. If you live in a city like San Antonio, or any one of the other larger cities, it is easy to dismiss the dangers of a wildfire. Believe me when I tell you that this is the first time we are very aware of this dangerous situation. Bill and I have been cutting down all the brown cedar trees around our house. It is a monumental job as we are surrounded by oak, cedar and other trees. And with no water in the river it would be difficult to save any structure because there are no water hydrants. 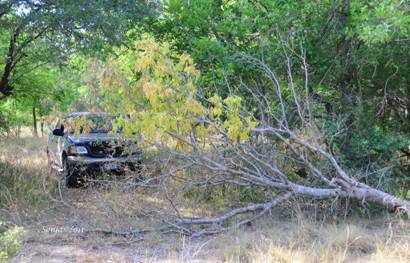 The oak trees are shedding their leaves for protection and the cedar trees are turning brown. There has been no display of wildflowers other than a sprinkle of yellow cactus blooms. We all miss the beauty of the wildflowers along the Texas highways which have been mostly absent this year. Even the cacti are dying. Huge trees are literally just falling over to their death. Ranchers are selling their livestock for lack of green pastures for the cattle to graze on. The historic levels for the Edwards Aquifer are 612.5 mean sea level for the lowest in 1956 and 703.3 mean sea level for the highest in l992. Water restrictions for the city of New Braunfels are at Stage II, and in San Antonio, Stage III was delayed due to yesterday’s ‘cold’ front of 97 degrees. Temperatures have been 100-104 degrees, not to mention the heat index which is usually higher. Dark clouds taunted us yesterday morning while we walked in the Rust Falls riverbed but just another false alarm. The weathermen on TV are forecasting rain in the next couple of days, but don’t count on it. I have enclosed another amateur video for your viewing pleasure? This was taken of the Guadalupe River at Rust Falls. Kayakers are usually plentiful in this part of the river. 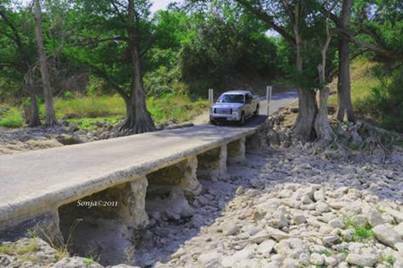 Residents of the 21st congressional district and nearly all of Texas continue to face a severe drought, which is bringing about ever-tightening water restrictions. Overall, this drought has already been rated as the 3rd harshest in Texas’ history -- October through May proved to be the driest period in modern recorded history. 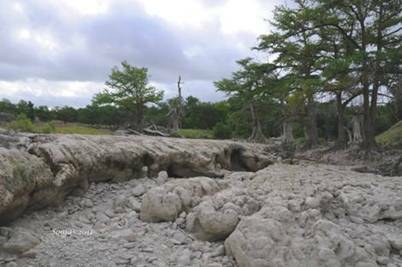 The drought is seriously impacting Central Texans, especially our farmers and ranchers. The San Antonio Water System (SAWS) is a great resource on the drought conditions and related water restrictions in the San Antonio area. The Edwards Aquifer Authority provides water for many along the Bexar-to-Travis I-35 corridor, and has detailed information on current drought restrictions. The Lower Colorado River Authority (LCRA) has information for Central Texans on forecasts and water supply status updates for communities and cities (including Austin) drawing water from Lake Travis. In the Hill Country, water authorities include the Upper Guadalupe River Authority, and the Headwaters Ground Water Conservation District, which provide water to Kerr county residents; and the Cow Creek Groundwater Conservation District, which serves Kendall County area residents. My district offices can also be a resource to you during this time, so please feel free to call my San Antonio staff at (210) 821-5024, my Austin office at (512) 306-0439, or my Kerrville office at (830) 896-0154. You can also visit my website at www.lamarsmith.house.gov. How's that praying for rain thing working out for you guys? Sure got yourself a great leader there.